IPFIX Collectors are becoming more popular with hardware vendors due to the integration of the network analyzing protocol being open to multiple vendors and the standardization it offers as well. 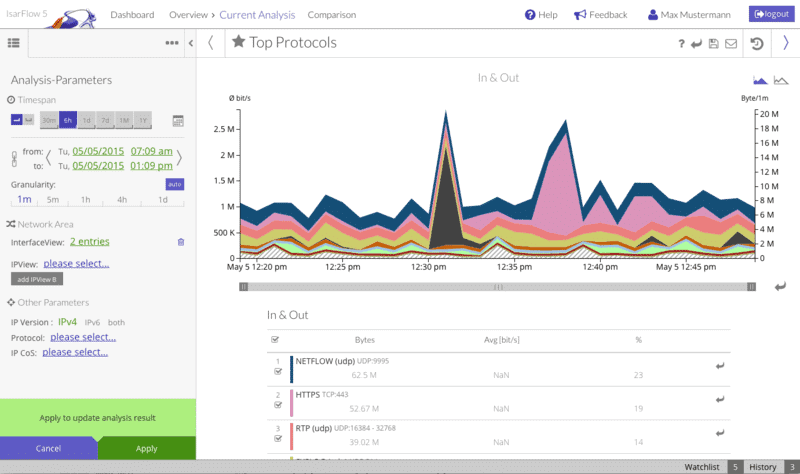 Netflow is fairly limited to Cisco products and a select few of other vendors, but the introduction of IPFix has given the industry a better way to monitor network flows and a array of additional information in ways Netflow isn't capable of doing. IPFIX is the technology that allows for the capture and analyzing of flow information from layer-3 switches, routers and firewalls to a central IPFIX Collector Software on your network. 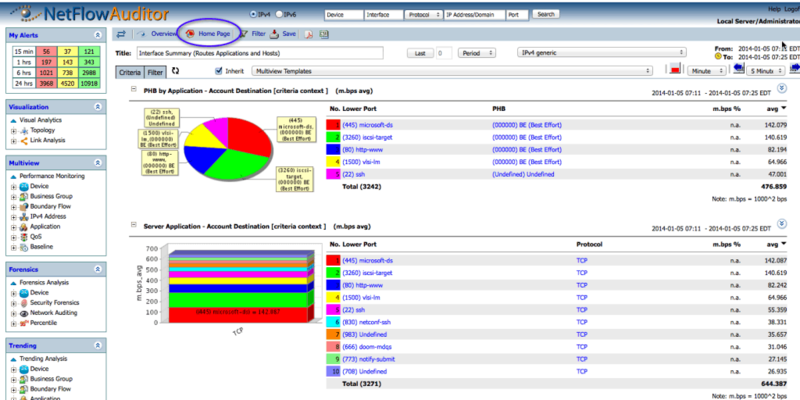 IPFix differs from Netflow in such a way that it allows for different types of information to be captured from the device, including proprietary information that a Vendor ID can integrate into the device and also has the ability to receive information about Syslog and SNMP that would otherwise be sent to those respective services/collectors. This will further cut down on network overhead and allow you to collect, organize, filter and analyze all the information from one software package rather than from multiple software packages. We've highlighted some of the Best IPfix Collector software packages below along with a quick overview of what each software does. Some of these are Freeware and others have Free Trials that are worth checking out, and some are Open Source. We've had good success downloading a trial version and testing it out and getting a good feel for it. Below you'll find some IPFix Collectors that also double as IPFix Analyzers – some of these are free and others are paid and they will all give you a great understanding of how flexible the protocol can be when setting it up correctly. 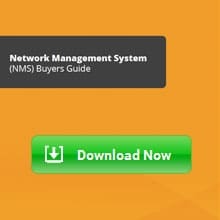 We Suggest that you download one of them and test it out on your network to get a better understanding of how it works and how flexible the software really is. Collecting and analyzing data using IPFIX will give you a great understanding of what is really going on within your LAN/WAN and see what services, websites, machines and other devices are using the most bandwidth on your network. 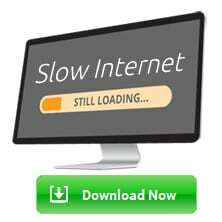 These software packages also work great when you need to Monitor your Bandwidth on your Network and Web Browsing. 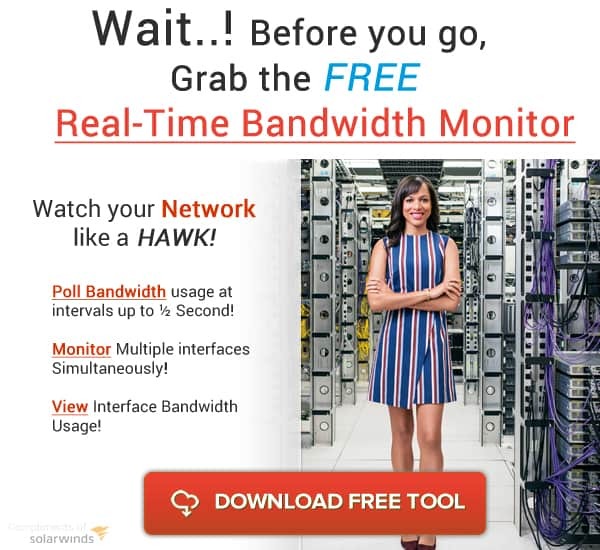 The Solarwinds Network Bandwidth Analyzer software package includes all the features you need to collector IPFix Flow information and packets as well as any other protocols that your network may be putting out. It includes automatic discovery of devices as well as network performance, fault and availability monitoring bundled into it. The bundle also includes the Network Performance Monitor with gives you a great overview of network devices and their bandwidth consumption and usage, as well as a easy-to-use dashboard that can be setup with Alerts and reports. The Netflow/IPFix Collector/Analyzer portion of the bundled software is called Netflow Traffic Analyzer and it supports IPFIX, as well as Cisco Netflow, Juniper J-Flow, sFlow, Huawei Netstream and other flow protocols and data. 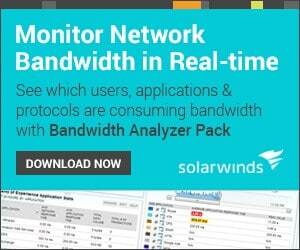 Download and Test the Collector/Analyzer on your Network Free. nProbe is a great IPFix probe that not only acts as a great Analyzer, but also as a Collector that can collect ipfix flows into a Database (MySql, Fastbit and sqlite). nProbe coupled with nTop works great for processing tons of flow information on larger networks, acting as a pre-processor by capturing packets from network interfaces, computing the flows based on the packets being sent and then sending them off to ntop for further collection, organization and analysis. nProbe is available for most operating systems including Windows, BSD, Linux and even Mac OSX. 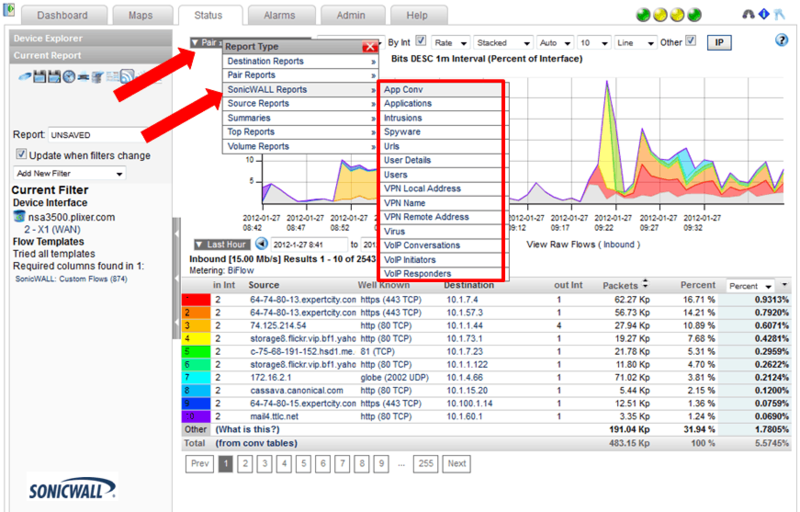 nProbe also supports Netflow v4/v5/v9 on top of IPFIX. 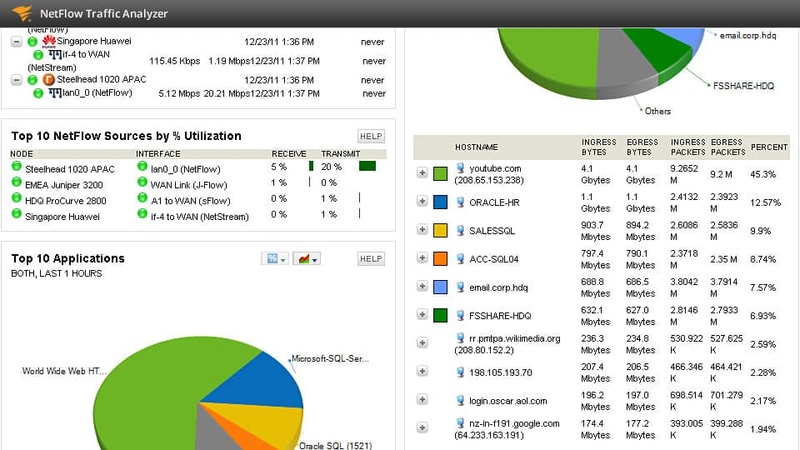 IsarFlow is great little tool that provides network monitoring using IPFIX as well as Netflow and SNMP data to collect and analyze network information and usage. It provides information on about your network that can prove to be valuable in analyzing usage and billing patterns that can be addressed and billed properly. 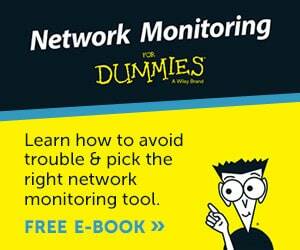 Things like Network load, compliance with SLA's, QOS and traffic flow analysis can all be monitored using this tool. Data can be customized by the network engineer/admin to generate customized reports that are personalized to different criteria and requirements. 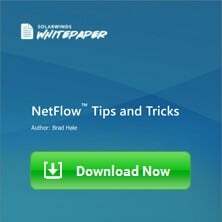 Netflow Auditor, as its name says, is not only a netflow specific collector and analyzer, but also has the ability to Collect flows from IPFIX, sFlow, jFlow, AppFlow and Netstream as well. It fully supports IPv6 along with Real-time analysis of packets and usage. This software packages allows admins and engineers a comprehensive look into their network, along with robust features including Intrusion detection (IDS) and Security and information Event Management (SIEM). This full featured tools allows for count analysis, which helps with analyzing P2P activity, DoS Attacks and Port scanning activities against your network. It also includes features such has Percentile, Packet Size, Deviation, Bi-directional and many of types of Analysis for a very in-depth look at the network flow information that is coming and going within your network. This software runs on Windows and Linux (including Redhat/Centos) according to their website and supports Firefox, Chrome or Internet Explorer supporting SVG/HTML5. Plixer Scrutinizer (which has a Freeware version available) is flow analyzer software that has the ability to not only be installed on a system of your choice, but Plixer has also given companies the open to buy a Hardware appliance or a Virtual (VMware) Appliance that are both highly scalable in terms of Flows Per Second and number of devices. The Hardware appliance can collect over 150,000 flows per second from over 1000 devices and the Virtual appliance can scale up to 1000 devices and collect up to 40,000 flows per second – These are both vastly greater than the 10,000 Flows per second and 100's of devices that the Windows installers allows for. One of the major benefits of Plixer Scrutinizer is its ability to scale to both hardware and virtual appliances giving it a distributed architecture and allowing for more collectors to be implemented at different locations of your network infrastructure. Scrutinizer not only supports IPFix, but netflow, sFlow, j-Flow and Netstream, making it very robust as many of the other software packages as well. Make sure to download one of the above IPFIX Collectors and Analyzers to get a better feel for what each of them does. Most of the software mentioned above will have a Free Trial version that can be downloaded and installed on your machine to test out their respective capabilities and features.